Forward by John Nicholson, author of the Nick Guymer mysteries. Imagine if the great detective Sherlock Holmes was placed into a different location, a different time and a different section of society. Imagine. In this alternative reality what would remain and what would be taken from the world around him? I dare you to imagine. In this series of stories, inspired by the works of Sir Arthur Conan Doyle, the eponymous hero Sherlock Holmes has been born on Teesside and lives in modern-day Middlesbrough where, with the assistance of his court-appointed psychologist Doctor John Watson, he becomes caught up in a series of knock-about investigations. 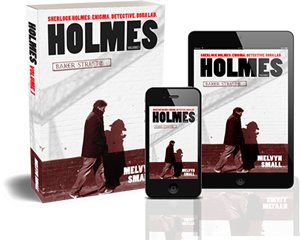 Holmes Volume 1 centres around Baker Street, Middlesbrough and romps through the surrounding locations of Billingham, Stockton-on-Tees, Norton, Saltburn, Wynyard and Wolviston. Having completed his court-ordered counselling of sessions of a repentant criminal, Doctor John Watson assumes he's seen the last of his wayward charge Sherlock Holmes. This changes on the arrival of two FBI agents, looking to track Holmes to make use of his "ethical hacking" skills in the search for a scandalous media file. The content of the file having the potential to unseat governments on both sides of the Atlantic. A group of youths involved in a reality television programme seek out the assistance of Holmes when the show literally disappears from its Middlesbrough location overnight. Given that the show apparently serves no purpose other than to line the pockets of those involved, Holmes' interested in the mystery of it all is instantly peaked. Following the disappearance of Martha Hudson's estranged husband in the Afghan Desert, Holmes and Watson begin an investigation to track down the missing solider which takes them on a train journey to far away Sheffield. John and Mary's first official date at a society event is brought to an abrupt halt when the guest of honour is found floating in the swimming pool. Watson drafts him Holmes to utilise his unique investigative skills to determine how this tragic event occurred, the unique insight Holmes provides being largely ignored by Detective Inspector Lestrade. When experimental pharmaceuticals are stolen from a laboratory in Belasis, Billingham, Holmes and Watson are engaged by John Openshaw, the CEO of the company, to recover the drugs before they start to reap their deadly potential. They face a race against time to get these killer drugs off the streets of Teesside. Fractious differences between Sherlock Holmes and Detective Inspector Lestrade need to be put aside following the discovery of a body, apparently tortured to death in the Twisted Lip pub. With little to go on Holmes needs to conjure up a line of investigation from nowhere. Who better to help than his faithful associate John Watson? Support independently-written literature and buy Holmes Volume 1 from Indipenned.com at an RRP discount. Or, stick with the corporates and buy from Amazon UK in either Kindle or paperback. Alternatively, you can order a copy from any other good bookshop by quoting the ISBN 978-1-908299-81-9.